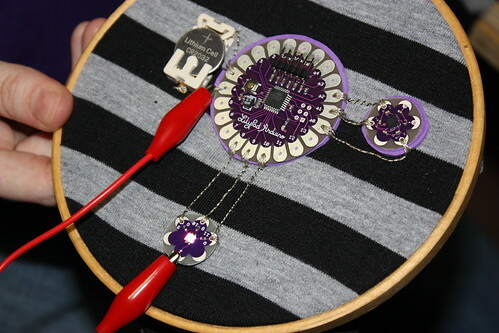 We will be holding two electronic fashion workshops over the weekend of Innovation Dublin week. These workshops will be hosted in our space on Arran Quay on Saturday 17th and Sunday 18th of October from 2pm to 6pm. There will be a €15 (€12 students/unwaged, €10 TOG members) participation fee to take part in the workshops. Non-members are welcome to participate in the workshops. The participation fee includes a basic electroluminescent wire kit and an item of clothing from an Irish menswear fashion label which is a canvas for your creations. 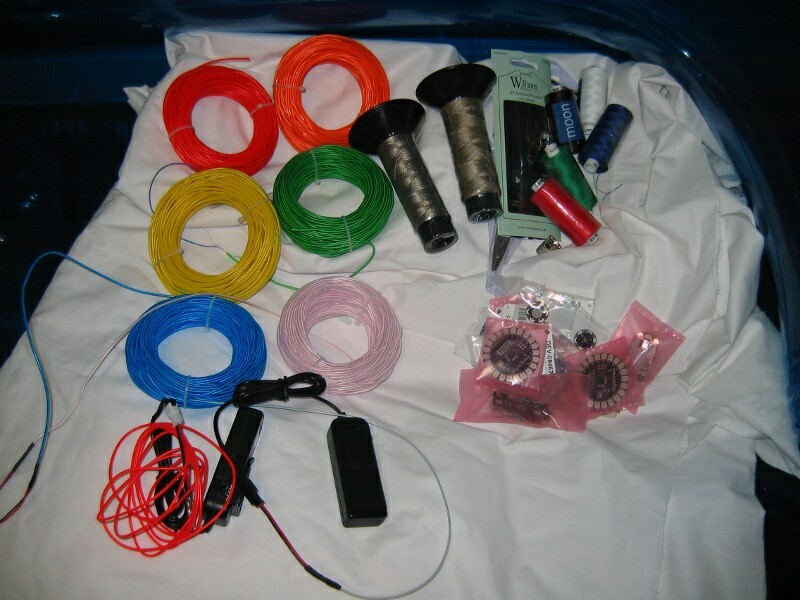 A range of sewing materials (including conductive wire), extra el wire, LilyPad’s and other electronic devices will be available for use during the workshop. No experience of electronics or sewing is required, though it would help. The number of places in each workshop will be limited to 12, so please reserve a place by posting a comment to this blog post, giving details of which workshop you would like to attend. Participants and visitors must be at least 18 years of age. Selection of parts and materials for the Electronic Fashion workshop. Top left electroluminescent wire. Bottom left electroluminescent drivers. Top center conductive wire. Top right sewing materials. Bottom right LilyPad controllers, sensors and transducers. Some of the electroluminescent wire in action. Getting to the space. 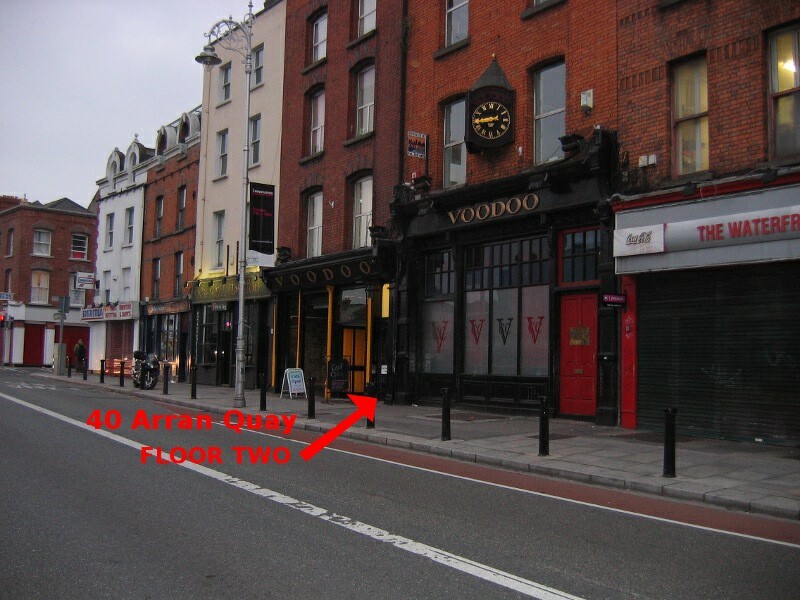 The space is located above the Voodoo Card Club on Array Quay, which is on the north-side of the river approximately 15 minutes walk form O’Connell Street Bridge or couple of minutes walk from the Smithfield Luas stop. Also see the map for more details. This was written by robfitz. Posted on Friday, October 9, 2009, at 12:55 am. Filed under Space, Workshops/Events. Tagged electronics, fashion, Workshops/Events. Bookmark the permalink. Follow comments here with the RSS feed. Post a comment or leave a trackback. 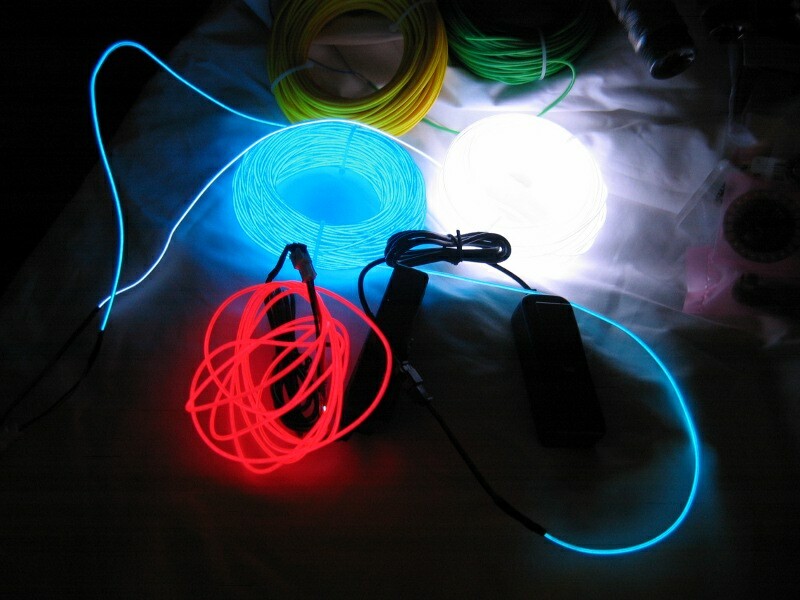 We sourced el wire kits, other electronic devices and a range of clothing items. I’m then looking forward to see what participants come up with. I’ll post some more details shortly. I’m in, and would prefer the Sunday. Looking forward to seeing what you have to play with. How long does the workshop last – from what time to what time? Depending on this I would like to do the sat workshop. We’ll be running the workshop in the space from 2pm through to 6pm, so you can come along at anytime. We might then head around the corner to Smithfield for food and drinks after. Electroluminescent clothing eh, is there a local rave we can attend after? Probably Sunday would suit me best. Hi, I would like to go to the Saturday one if possible. Thanks. hi, can i apply for a sunday 18th workshop please? think i’ll swing past on saturday. could be fun! I would like to attend saturday, sounds cool!